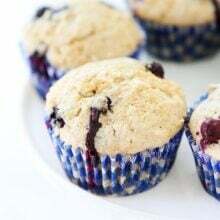 Vegan Banana Blueberry Muffins – whole wheat vegan banana muffins dotted with blueberries. 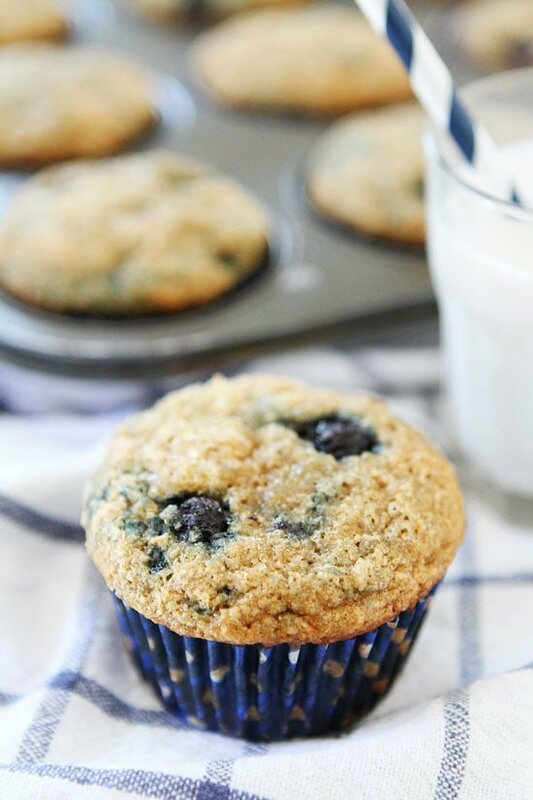 These vegan blueberry muffins are great for breakfast, snack time, and they freeze beautifully! After the busy holiday season, I took a few days off from baking. My break didn’t last long because Caleb begged me to bake banana muffins for breakfast. I can never say no to his cute little face so I went to the grocery store and bought a bunch of brown bananas. I love that most stores sell overripe bananas at a discount! They can always count on me to buy them! I came home and got busy in the kitchen! I granted Caleb’s wish and made Vegan Banana Blueberry Muffins! These vegan blueberry muffins freeze beautifully, which is another bonus. We usually eat a few when I pull them out of the oven…it is too hard to resist a fresh, warm muffin. I try to save the rest for the freezer so I can give Caleb a banana blueberry muffin when he asks for one, which is just about every day! To defrost, pop a muffin in the microwave for 30 seconds and you are good to go! 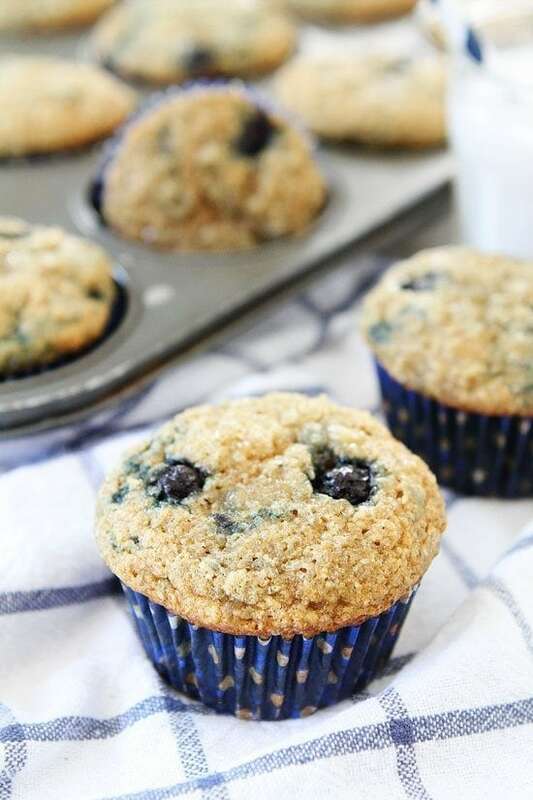 If you are looking for a healthy breakfast treat, give these Vegan Banana Blueberry Muffins a try! They are a favorite at our house. 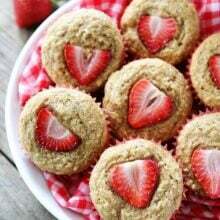 These healthy muffins are easy to make and they freeze beautifully! They are Caleb's favorite! Fill muffin liners three-quarters full. Sprinkle with turbinado sugar, if desired. Bake until toothpick inserted into center comes out clean, about 25 minutes. Transfer to wire rack to cool. Store, covered, at room temperature. Note-these muffins freeze well. To reheat, place muffin in the microwave for about 30 seconds. Pinned! 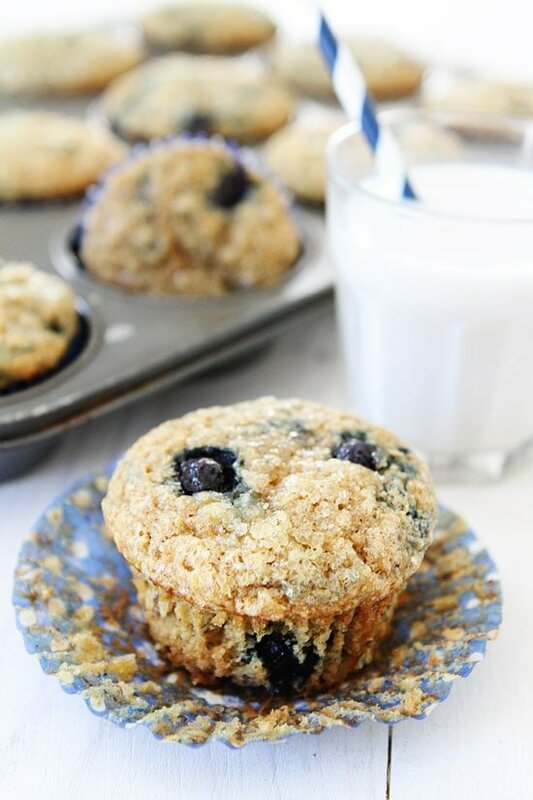 Maria, these muffins look like the perfect puffy, light and healthy breakfast or snack. I think we need to make some this weekend! totally lovin’ all up on the whole wheat and coconut oily goodness of these muffins! I need some healthyish easy breakfasts for MY caleb (my husband) so these are perfecto. Pinned! These look awesome and I love that it’s vegan. So tasty and love that it’s filled with blueberries! these look perfect Maria- love that they are vegan! These look perfect! 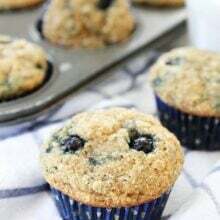 I’ve never added blueberries to my banana muffins but it sounds like a grand idea 🙂 YUM! 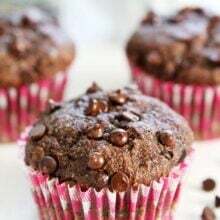 These muffins look so tender and delicious! Perfect! These muffins look awesome, Maria! I can’t believe they’re vegan. I invite you to share this yumminess at the hop ( you can link up thorough Sat midnight) Hugs! I love that they are Vegan. Can you subsitute applesauce for the coconut oil? Sure! The texture will be a little different. You can never go wrong with a classic home-made banana and blueberry muffin. These looks so delicious! Wow, this looks so amazing! I am trying to watch nutrition this year, so excited to see those. wow, these muffins are delicious! I couldn’t stop eating the batter, YUM! Thanks for a great recipe! These look soooooo good! I’m always on the lookout for quick and easy healthy snacks, and this just shot to the top of my to-make list. Love! I am not surprised he has no clue. They look wonderful. My local Kroger store just had largish containers of fresh blueberries on sale. I stocked up on two. So I find these quite appealing. I love blueberry muffins and since these are whole wheat I am looking forward to eating these without any guilt!! Thanks for a wonderful recipe! I love how sneakily healthy these are! They look totally delicious…I’d never suspect they were healthy muffins! I don’t have a microwave, how would you recommend heating them up in the toaster oven? You can slice the muffins and toast them. They are good at room temperature too! Pingback: . link love 1/11 . - . running with spoons . Perfect breakfast treat! I need to make these for my family soon! I am going to make these tomorrow! Thanks for the perfect recipe! I almost always have all of these ingredients on hand! This looks really delish & would make the perfect breakfast treat! 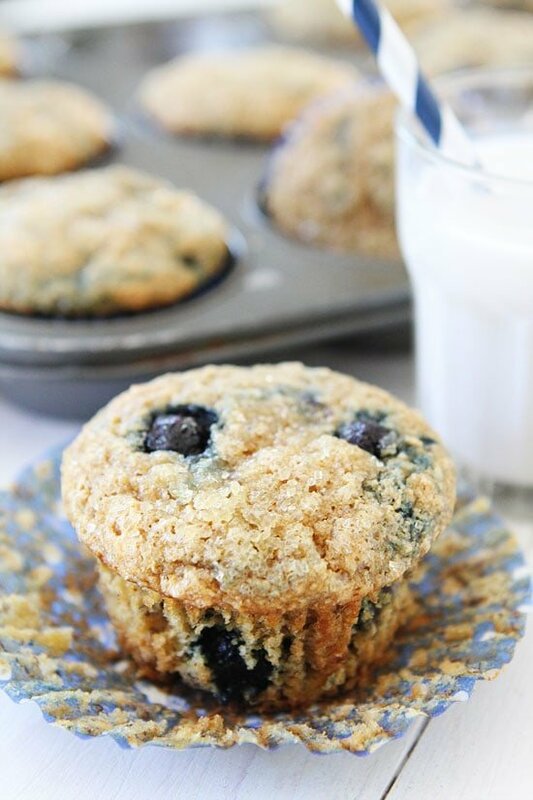 I can’t wait to try these out because I absolutely love blueberry muffins! These were a huge hit in my house. Made a double batch and had to hide the last one from my husband for my daughter’s breakfast. They are being added to morning breakfast rotation. Glad the muffins were a hit! They are a favorite at our house! I love seeing all of the vegan recipes you have posted. These muffins were delicious. Thank you for the recipe! 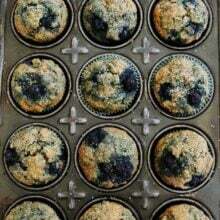 I woke up thinking about homemade blueberry muffins, so it was perfect that a Google search landed me here! These were yuummmm! Best muffins I’ve had since becoming vegan several years ago…I will definitely make these again (and again. And again)! Thank you for sharing! These are not bad! There actually really good! These are in the oven! Only had white sugar not brown, and unflavoured almond milk…I put in extra vanilla to compensate. Hoping they turn out alright! Also threw in some extra bloobs. They smell amazing already! Looking forward to baking these for my vegan wife on Friday. Thanks for the recipe. Does anyone know the calorie count for one of these bad boys? I tried baking these. My sugar had hardend way to much, so I ended up using an extra banana. And I wasnt gentle enough when I added the blueberries. They ended up looking like blue-gue, but wow; so delicious! I will make these again! Loved them. Thank you for sharing your recipe. I made these tonight and they are really delicious. And easy to make! I will definitely be making these again. If using frozen blueberries, do they need to be thawed? No! Just stir them in! Enjoy! Wonderful!!!!! I used very ripe banana and did not use any sugar. They were great!!!!! Being a vegan some muffin recipes can end up a bit stodgy and dry..These are absolutely delicious! By far the best vegan muffins I have made so far -clean ingredients, moist, lovely flavor and soooo Moreish!! This will become a regular in our house. Glad you liked them! Our boys love them and so do I! OMG, thank you SO MUCH. I’ve been searching for a good vegan banana muffin recipe for some time now, and they always turn out stiff, they don’t rise and they taste really unimpressive. Your recipe was a win since the batter (I almost didn’t put them in the oven)!! My whole family LOVED them, and it only made me happier that they don’t have anything that comes from animals! <3 Regards from Brasil! We’ve been enjoying these for over a year now. What a fun way to interact with my homeschooled son. These provide a perfect healthy treat for our poetry teatimes, too! We love these! We made 12 muffins. Do you know calories per muffin? Wow, these are absolutely INCREDIBLE! The banana works great as a sub for egg, you would never even know they’re vegan! Yay! So happy you liked the muffins! So delicious! I am not convinced of the health properties of coconut oil so substituted with vegetable oil, added a couple Tablespoons of Flaxmeal and an extra 1/2 cup of blueberries. Thank you for a great recipe! Absolutely moist and flavorful. Easy to make, too. One of our favorites. Glad you liked them too! Love these!!!! So easy and so tasty! My family loves them everytime i make them and they are such a hit! I made these for the first time today and both my daughters loved them. This recipe is going to be regular from now on. Thank you so much! He’s muffins were really good snack muffins, they’re not too sweet so you can give them to your kids without feeling guilty. If I was serving them to company I might add a little sugar. My daughter ate 2 immediately. They’re in the oven Looking forward to some vegan deliciousness! Thank you! Now mummy go-to muffin recipe. Awesome. I txswwweee need to make some but one banana and a few blueberries! Your recip is best! I liked and I have at home! Excellent texture and flavour. I did cut the sugar down to 1/3 cup and did not sugar the top. These are so easy to make. Those are awesome! Just the right amount of sweetness! Pretty chewy. Can’t stop eating them!! Thank you so much for this great recipe!